Victoria is having its moment. Thanks to a landmark new property development, this leafy neighborhood of palaces, parks, and theaters is rapidly becoming the coolest, most cutting-edge destination in London. The $2.8 billion Nova complex, which was completed this year after four years in development, is bringing new life to Victoria. Comprising five striking buildings, this “urban village” offers 85,000 square feet of inventive and inspirational restaurants, bars and shops. The Rubens at the Palace, one of the most luxurious and distinguished hotels in London, sits right opposite Nova, in the heart of Victoria. With the splashy new landmark on one side and Buckingham Palace on the other, the hotel literally bridges the gap between old and new London. Like Victoria, The Rubens has also just completed an upgrade: a multi-million dollar renovation has resulted in the full or partial refurbishment of all bedrooms and public areas, and has added additional luster to a historic hotel that was already sumptuously appointed and magnificently designed. Each of the 163 rooms at The Rubens is dressed in regal colors, plush fabrics and personal thoughtful touches. Though the timelessly elegant design harkens back to the Edwardian era, modern innovations such as Wi-Fi and interactive TV are seamlessly blended throughout. Some of the rooms overlook the Royal Mews at Buckingham Palace, where guests can catch a glimpse of the royal carriages. In fact, in the early 1900s, the hotel's location adjacent to the palace made it a popular spot for visiting nobility and international VIPs. In addition to its incomparable accommodation, The Rubens boasts several cutting-edge eateries. Try British classics at the new brasserie-style English Grill, which opens September 1st; sip innovative new cocktails and hear live music at the Cavalry Bar; or feast on South African-inspired fare at the adjacent bbar & Restaurant. The new Curry Room restaurant will soon be opening as well, serving the finest Indian cuisine from around the world in relaxed and convivial surroundings. And no visit to London would be complete without a traditional British tea, which can be taken at the hotel's Palace Lounge while watching the carriages come and go from the Royal Mews. The Rubens' commitment to sustainability is evident in the Living Wall, which covers 350 meters of the hotel's exterior. Its carpet of 10,000 herbaceous plants improve both the air quality and aesthetic of the neighborhood and provides an urban home for countless bees, butterflies and birds. During your next visit to London, stay at The Rubens at the Palace, a classic hotel at the epicenter of a neighborhood undergoing a stunning transformation. 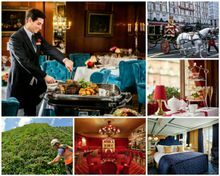 For more information and reservations at The Rubens at the Palace, call +44 20 7834 6600, visit www.rubenshotel.com, or email bookrb@rchmail.com.